This is a forward thinking bill that provides justice in the 21st century. Copyright nor “trade secrets” should ever stand in the way of an equitable, accountable municipal government. This bill needs accountability within the Administration and Agencies; there should an annual report. Each algorithm should have a dictionary, similar to existing the city’s open data law. Collectively, algorithms should be accessible via a single catalog and best practices should be documented within a technical standards manual, similar to the City’s existing open data law. Thank you for this opportunity to vocalize our support for Intro 1696-2017. Today, I speak as the Executive Director of BetaNYC, a former Technology and Democracy fellow of Harvard Kennedy School’s Ash Center, and a former fellow at Data & Society Research Intuition. 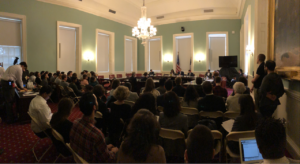 For the past five years, BetaNYC has worked with two Mayoral Administrations and the City Council to ensure the City has the best municipal open data law. While we continue to improve its language, we are honored to see this introductory bill tackle an important part of our 21st century. BetaNYC is a community of over 4,400 technologists, designers, data scientists, and civic hackers who want to see an equitable municipal government in the 21st century. This legislation reinforces the core of a future equitable municipal government. In 2016, Data and Society Research Institution produced a number documents outlining what is as stake. We must be concerned about technology companies as “dominant curators of information and their unprecedented power to engineering the public sphere” and social services. To be blunt, the future of our democratic practice is at stake. If we refuse to hold algorithms and their authors’ accountable, we will no longer have government for the people, by the people. If we refuse to hold algorithms and their authors’ accountable, we outsource our government to the unknown. At NYC School of Data, our annual conference, we hosted a panel on algorithmic discrim-innovation and we discussed how parts of our criminal justice system governed by a black box. How can we talk about justice when we can not see software code, algorithm, no hold the underlying software accountable in the same way we hold humans accountable? Democracy requires transparency; copyright nor “trade secrets” should ever stand in the way of an equitable, accountable municipal government. We are very fortunate that the city’s existing open data law provides a framework for this bill. In our written testimony, we’ve outline a few core components we would like to see added. BetaNYC looks forward to a healthy and honest debate around the passage of the nation’s first open algorithms law. Someone within the Administration and someone within each agency should be designated as a point of contact for the publication and reporting of algorithms. Annually, there should be a report that outlines agency reporting and use of algorithms. In the same way the City pioneered open data directories and catalogs, the City should produce a central listing of published algorithms. This directory doesn’t need to be as advanced as the city’s data portal, but it would be nice to have a comprehensive listing of algorithms title, purpose, code, function and attribute documentation, public liaison & their contact information, date of introduction, and method to test the code. Like all technical objects, each algorithm should have a small dictionary that explains the function, its purpose, and data sources. Similar to the City’s open data law, there should be a technical manual that highlights the City’s algorithmic use, practice, and best practices. We, the people, will need the ability to ensure that Administrations and Agencies comply with this law. Please ensure that the the public can hold Administrations and Agencies in compliance with the law.